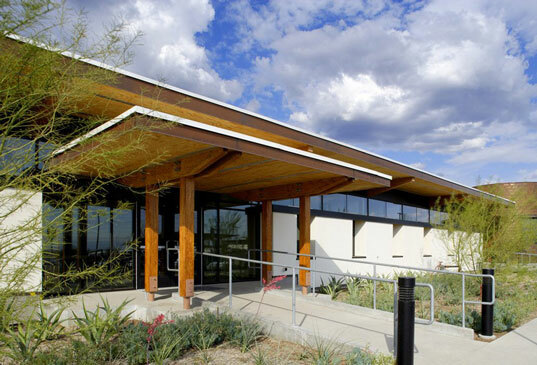 A mix of desert climate, high performance goals and the insight of a leader in sustainable design has yielded one of the first LEED Gold-certified straw-bale buildings in the world. Resource- and energy-efficient, the Santa Clarita Transit Maintenance Facility designed by HOK exceeds California Energy Efficiency Standards by more than 40 percent, securing a new standard for straw-bale in high performance building design. The new transit facility was created as part of a citywide initiative to reduce hydrocarbon and ozone emissions from vehicles. The project’s intention is to serve the conversion of the city bus fleet from diesel to compressed natural gas and offer a publicly accessible CNG fueling station. HOK led the integrated design project to meet high sustainability goals within a modest budget and on a challenging desert site prone to seismic activity. Using straw bales for wall infill targeted the need for a durable, low-cost, non-toxic, highly insulating material suitable to the extreme climate of the region. HOK coupled high-recycled-content engineered wood with the characteristic thickness of straw-bale building design to allow structural elements to act as finished surfaces, minimizing the need for finish materials. 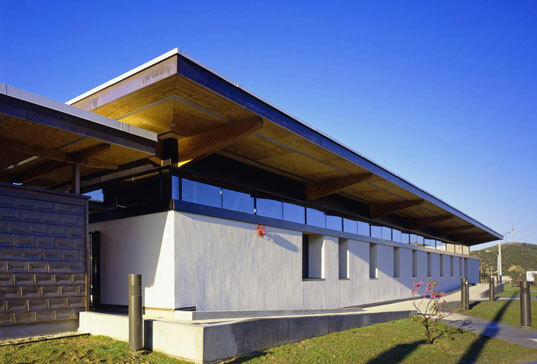 With a focus on insulation, the team combined the thick straw-bale walls with high-performance glazing and a highly insulated roof to produce a building envelope that shields interior spaces from extreme solar gain and regulates indoor temperature. Inside the transit facility is a showcase for indoor environmental quality with wheat straw board casework and millwork. Recycled, renewable, low-toxic and locally sourced materials were used throughout the building in keeping with the low toxic, sustainable qualities of the straw-bale infill. The designers opted for a solar photovoltaic canopy to shade buses and provide almost half of the building’s annual energy needs. An electronic monitoring system tracks thermal comfort, energy efficiency and moisture levels ensuring the owner can continually improve on the building’s operating performance. Transportation is far from the only issue. We built the first straw bale in our city and the embodied energy / appropriate technology table was complex. I'm not sure about the UK, but for our site in California here are just a few of the considerations you might look at. 1. The straw here cannot carry any loads, they are a wall substrate that provides extreme client satisfaction regarding insulation, sound attenuation, and pleasingly deep walls. Our's was a pole-house with raised floor (hidden behind a field stone skirt) not a "strawbale house" as most refer to it. "Strawbale houses" may require more framing investment than conventional frames. 2. Conventional grain production: if the straw is not burned in the fields, are pesticides required as a replacement procedure? In temperate climates what are the water issues re sustainable grain production. 3. Organic grain production: I asked the largest organic grain producer in CA at a conference if folks were knocking on his door for organic bales. Mr. Lundberg replied "no way, not a single straw leaves the fields in an organic [closed loop] system" So, straw is only considered a "by-product" by conventional ag-industrial technology. Hmm, some food for thought. Not only is the building beautiful, it's functional and green and eco friendly! That's fantastic! @Pete: certified sourcing for straw in the US? not that I know of, but LEED will allow one to document the source of resource extraction and the source of manufacture. Each of these can earn the project one point if the location is within 500mile radius of the project site. This theoretically supports local economies and reduces GHG emissions. Off-topic: Some arguement could be made that shipping by sea is more efficient than by truck (I'd have to check sources on that) and that supporting developing economies elsewhere in the world is a good thing, too. If the project site is near a major seaport, a lifecycle analysis might be worthwhile relative to "local" materials. I was recently working on a BREEAM assessment (UK equiv of LEED) of a straw bale building, and came into difficulty with the 'responsible sourcing of materials' credit. There is currently no certification system for straw bales in the UK to ensure their sustainability (and there are some instances when they could be potentially unsustainable e.g. travelling long distances). So my question is, is there any system of certification or criteria for the sustainable procurement of straw bales in the US for LEED, or is it just assumed?